This takes a bit of time to make but it’s worth it in the end. You’ll end up with a bowl of savory homemade warmth. It’s a lighter soup, so you may want to serve it for lunch or pair it with biscuits, a salad, or gf panini for dinner. It also freezes and reheats well, so make extra. And if you use low sodium broth, no salt added tomatoes and tomato sauce, you can cut the amount of salt in this considerably. Put everything except the beef in a large stock pot. Bring to a boil and then simmer over low heat for 1 hour. Add beef and simmer for another hour. If you are using rice, add it in about 30 minutes before serving. 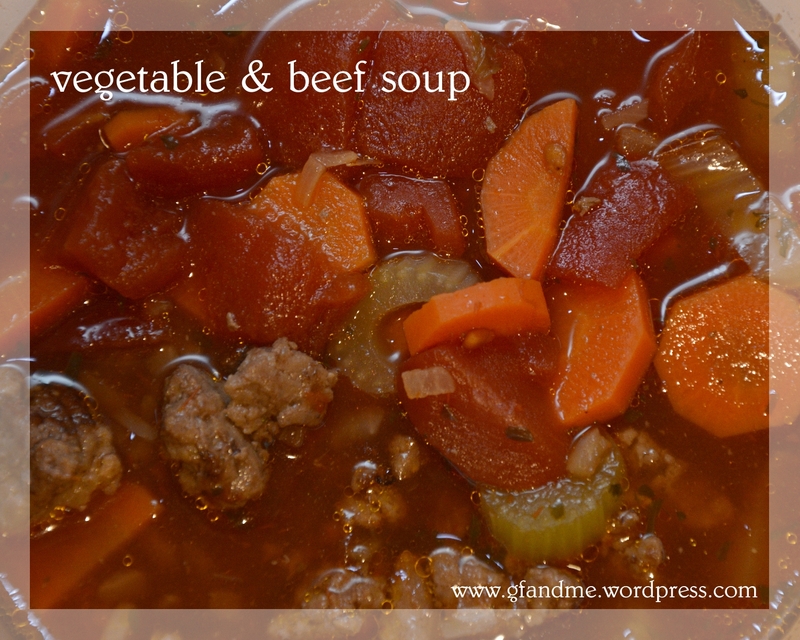 This entry was posted in Lunch and Dinner, Recipes and tagged beef soup, celiac, coeliac, GF, gluten free, gluten free in Red Deer, hamburger soup, recipe, vegetable soup. Bookmark the permalink. This looks amazing. We will be trying this in my home soon. Check out a recipe on venison stew I found and really liked, you might like it. Thanks. And that stew does look really good!